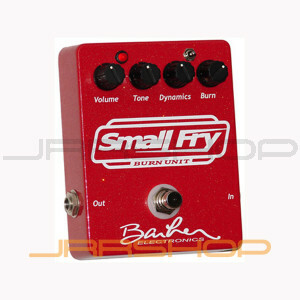 The Small Fry delivers some of the most sought after tones ever! By using unique circuitry and implementing a dynamics control which is continuously variable, the great tones of the past, present and future are available to the discriminating guitarist. Users can dial in explosive pick attack with total note definition which resolves chords as harmonically rich as 13ths and maj7's with absolute clarity! The Small Fry can also create a fat semi-clean boost which will warm up even the coldest of amplifiers while providing a walloping punch in level!! Precision matched components-using proprietary specifications to ensure symmetrical and specific asymmetric clipping and reduced intermodulation distortion. This allows complex chords to be heard with total definition and clarity at any level of overdrive. Hand made-we make the Small Fry one at a time and each one is signed and dated by the craftsman. Unique control- The note shape allows you to adjust your sound from tight and focused to a big round vintage tone, The dynamics control has earned a great reputation over the years for setting the transfer to smooth singing overdrive or raspy growling deep dynamics, continuously! Barber adjustable phono style recovery stage- Most of our op-amp based overdrive pedals use a cool old stylephonograph circuit to recover the frequencies lost in the overdrive stage, this worked great for vinyl and now works great for guitar overdrive! High quality components- Players have requested the use of carbon resistors, metalized polyester caps. These components were thought to be only available on the highest priced pedals. Players asked, and we deliver...no problem, no exaggerated "boutique builder" pricing.